From two new Seattleites comes Celine Patisserie. 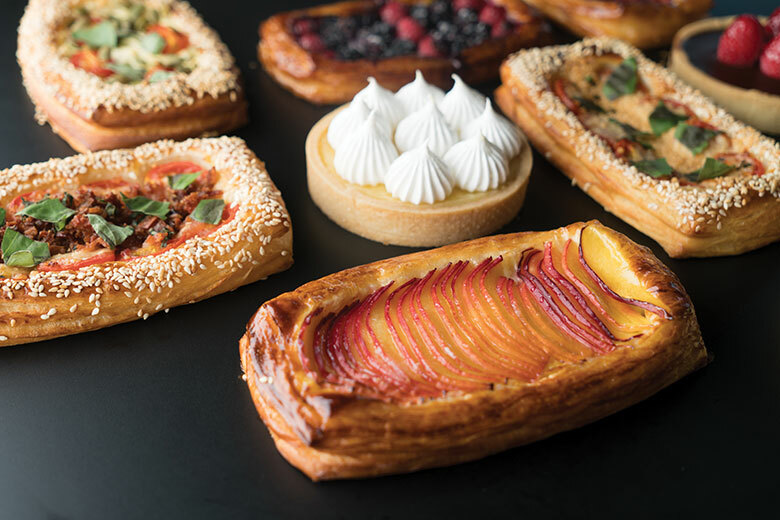 Alexei and Daniela Bucos hadn’t been in Seattle for even a week when they signed the lease on the Phinney Ridge spot—formerly Picnic—that has become Celine Patisserie. The well-traveled couple chose to open the café they’d long dreamed of here because of the community, and because of the vibe, which is less frenetic than that of their previous home in Dubai, but more urban than the small Italian town where Daniela grew up. They loved the Bay Area—where Daniela learned how to masterfully fold croissants and craft elegant tarts at the San Francisco Baking Institute—but couldn’t find the right space (for the right price) there. A lengthy cross-country road trip last spring landed them in Seattle, where they’d never been and knew no one. Now, the charming couple has made a home for their family here while creating the kind of cozy neighborhood spot where regulars chat over Italian espresso, and young kids, like their own (they recently welcomed a third daughter), beg for the jewel-toned macarons ($1.95 each) in the glass pastry case. Mornings bring picture-perfect galettes (sweet with seasonal fruit or savory with bacon or goat cheese, $4.75) and burnished croissants; midday means house-made soups; and afternoon necessitates a sweet pick-me-up, such as a personal-size lemon meringue or fresh fruit tart ($5.95). It’s a simple café and the owners, who are new to the industry, are figuring things out as they go. But with friends helping in the open kitchen and a lot of passion, they’re hoping to make it a success. Phinney Ridge, 6801 Greenwood Ave. N; 206.466.5378.